All of my losses were early. I never got to see an ultrasound picture, never felt little kicks, never even got into my maternity jeans. The only way that I knew that there was anything to miss were positive pregnancy tests that gradually faded from one line to two. That and vomiting in some seriously embarrassing and very public moments. My pregnancies were mere ‘blips’ to the world. Missed periods. Chemical pregnancies. Not ‘real’ babies. I’ve heard it all, and it all hurts. While they might not have been delivered or taken their first breath earth-side, the second I saw those two lines I had visions of gummy babies grinning at me, first steps, days doing school and learning to read. Their lives flashed into being and just as quickly flashed out again. I had no pictures of them, no hand or footprints, nothing to hold on to besides my memories. 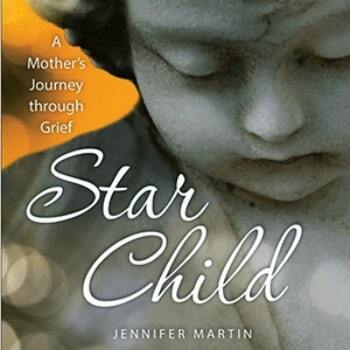 Related: I Had an Early Pregnancy Loss, Do I Still Have the Right to Grieve? When my autoimmune system went crazy, and I became allergic to my original wedding set, I knew that I wanted a new one, something simple but with meaning. I wanted a fresh start as we both had decided that because of my health, physical and mental, that we needed to stop trying. It was heartbreaking but relieving at the same time. These rings were meant to serve as a reminder that we had survived the first 10+ years and were coming out stronger together. Battered, bruised, hurting, but together. I needed to memorialize my babies, and I wanted to do it in a piece that I would be able to wear daily. I searched Etsy, wanting something handmade and original and I found it. 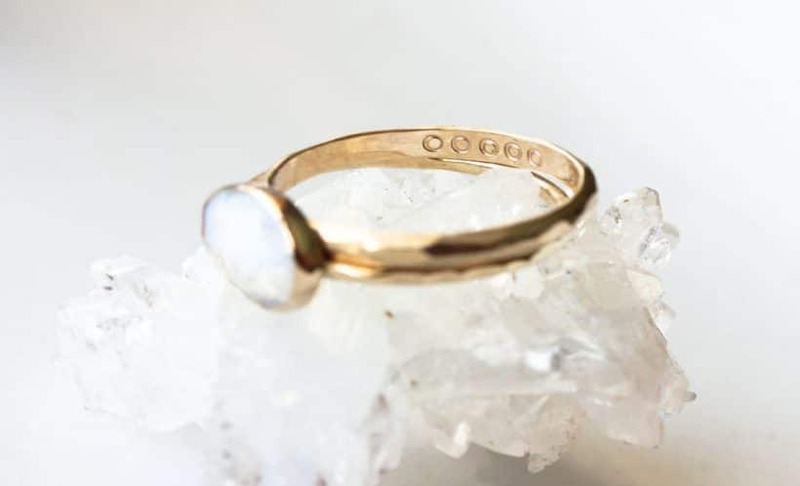 Belinda Saville worked with me to create my dream rings: a rainbow moonstone in yellow hammered gold, bezel set, and thin bands. I wanted a rainbow moonstone to represent my daughter, our rainbow baby after a first miscarriage. The blue flash would surprise me always, as she did. The hammered gold was to remind me that even though something could look fragile and precious, it was strong and could take a beating. The bezel setting surrounding the moonstone was protection for it, something that we promised each other we would do relentlessly for our daughter. The hidden treasure was inside the band. I asked Belinda if there was a way to mark my five miscarriages and we decided on stamping five small circles on the inside of my wedding band. Nestled together in a row, My Five would always be close, touching my skin but unseen to the outside world. Perfect. The reason we place the wedding rings on the ring finger of the left hand is that this was the finger, thought by the Romans, that had a vein that connected directly to the heart. I don’t have any physical representation of my babies I’ve lost, but they are wrapped around my heart. They were real, if to only me. My five small circles give me some comfort that although they couldn’t stay, my babies will always be nearby. Jill Kawchak is the proud mama to one truly amazing daughter, the wife of a good man, and a companion of a very troublesome Labrador retriever. Her days are spent homeschooling from the shadow of the Rocky Mountains in Cochrane, Alberta, where her daughter constantly begs to go exploring. She had always wanted to be a mother and started TTC just after her wedding in 2006. Jill has been diagnosed with PCOS, and was told motherhood would be a difficult goal to attain, but after 3.5 years of infertility with one early loss, the clouds parted, and the sunshine that was a little girl with blue eyes and brown curls broke through. However, in the years since her daughter arrived, there have been another 4 early losses. After *much* debate, angst and tears, Jill and her husband, Mark, have decided to end their fertility journey and are now focused on 'what comes next'. 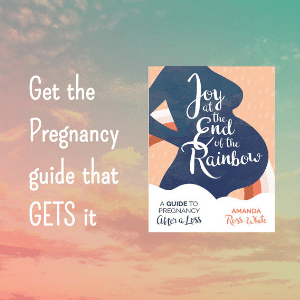 She writes to keep sane, and support those who are also experiencing infertility and baby loss.